Of Grammatology (French: De la grammatologie) is a 1967 book by French philosopher Jacques Derrida that has been called a foundational text for deconstructive criticism. It is one of three books, the others being Speech and Phenomena (French: La voix et le phénomène) and Writing and Difference (French: L'écriture et la différence), that Derrida published in 1967 and which established his reputation. The book discusses writers such as Claude Lévi-Strauss, Ferdinand de Saussure, Jean-Jacques Rousseau, Étienne Condillac, Louis Hjelmslev, Martin Heidegger, Edmund Husserl, Roman Jakobson, Gottfried Wilhelm Leibniz, André Leroi-Gourhan, and William Warburton. The English translation by Gayatri Chakravorty Spivak was first published in 1976. A revised edition of the translation was published in 1997. A further revised edition was published in January 2016. The work was initially submitted by Derrida as a Doctorat de spécialité thesis (directed by Maurice de Gandillac) under the title De la grammatologie : Essai sur la permanence de concepts platonicien, aristotélicien et scolastique de signe écrit (Of Grammatology: Essay on the Permanence of Platonic, Aristotelian and Scholastic Concepts of the Written Sign). His submission was unsuccessful. Derrida argues that throughout the Western philosophical tradition, writing has been considered as merely a derivative form of speech, and thus as a "fall" from the "full presence" of speech. In the course of the work he deconstructs this position as it appears in the work of several writers, showing the myriad aporias and ellipses to which this leads them. Derrida does not claim to be giving a critique of the work of these thinkers, because he does not believe it possible to escape from operating with such oppositions. Nevertheless, he calls for a new science of "grammatology" that would relate to such questions in a new way. Of Grammatology introduced many of the concepts which Derrida would employ in later work, especially in relation to linguistics and writing. The book starts with a review of Saussure's linguistic structuralism, as presented in the Course in General Linguistics. In particular, Derrida analyzes the concept of "sign", which for Saussure has the two separate components of sound and meaning. These components are also called signifier (signifiant) and signified (signifié). Derrida quotes Saussure: “Language and writing are two distinct systems of signs; the second exists for the sole purpose of representing the first.” Critiquing this relationship between speech and writing, Derrida suggests that written symbols are legitimate signifiers on their own—that they should not be considered as secondary or derivative relative to oral speech. 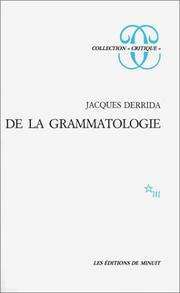 Of Grammatology is one of three books which Derrida published in 1967, and which served to establish his reputation. The other two were La voix et le phénomène, translated as Speech and Phenomena, and L'écriture et la différance, translated as Writing and Difference. It has been called a foundational text for deconstructive criticism. De la grammatologie (Paris: Les Éditions de Minuit, 1967). Of Grammatology (Baltimore & London: Johns Hopkins University Press, 1976, trans. Gayatri Chakravorty Spivak). Of Grammatology (Baltimore & London: Johns Hopkins University Press, 1997, corrected edition, trans. Gayatri Chakravorty Spivak). ↑ "Of Grammatology". jhupbooks.press.jhu.edu. Retrieved 2016-04-11. ↑ Alan D. Schrift (2006), Twentieth-Century French Philosophy: Key Themes And Thinkers, Blackwell Publishing, p. 120. ↑ Rabinowitz, Nancy Sorkin (2008). Greek Tragedy. Malden, MA: Blackwell Pub. ISBN 978-1-4051-2160-6. p. 5: "Jacques Derrida's Of Grammatology, a foundational text for deconstructive criticism, works closely with Plato". Derrida, Jacques (1997). Of Grammatology. Baltimore: The Johns Hopkins University Press. ISBN 0-8018-5830-5. Bradley, Arthur. Derrida's Of Grammatology (Edinburgh: University of Edinburgh Press, 2008). Culler, Jonathan. On Deconstruction (Ithaca: Cornell University Press, 1982). de Man, Paul. "The Rhetoric of Blindness: Jacques Derrida's Reading of Rousseau," in Blindness and Insight: Essays in the Rhetoric of Contemporary Criticism (Minneapolis: University of Minnesota Press, 1983, second edition) 102-41. Harris, Roy. Interpreters of Saussure (Edinburgh: University of Edinburgh Press, 2001) 171-188.